A new study has illustrated the effectiveness of radiation therapy with hormone therapy as a treatment for men with more aggressive (high risk) types of localised prostate cancer. 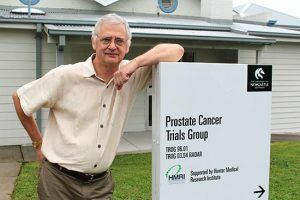 The RADAR study, which was run through the Trans-Tasman Radiation Oncology Group (TROG), included more than 1000 Australian and New Zealand prostate cancer patients who received a combination of testosterone suppression therapy (hormone therapy) for either 6 or 18 months, given with 7-8 weeks of radiation therapy treatment targeted at the prostate gland. It found that the combined treatment over a longer period lead to a 30 per cent reduction in prostate cancer deaths and a 40 per cent reduction in cancer spreading metastases to other parts of the body compared to the shorter hormone treatment. “We also found that that men who received 18 months of hormones did not experience more side effects or impaired quality of life factors than those who received the six months of hormone treatment,” Professor Jim Denham, who headed the landmark trial, said. The findings of this study are practice-changing both in Australia and New Zealand and around the world. It is the largest study of its type to ever be conducted with such a long follow-up period and will help radiation oncologists internationally looking after men with this type of prostate cancer. Professor Jim Denham says the new trial shows how men can be spared long-term effects of prostate cancer treatment. The study has also underlined the high effectiveness for this combination treatment and means that many men who used to be given for two or three years of hormones (testosterone suppression therapy) likely do not need such a long treatment. About 22,000 men in Australia and New Zealand are expected to be diagnosed with prostate cancer during 2019. Radiation therapy is a safe, cost-effective and often curative treatment for many prostate cancers and various other cancers as well. Men with prostate cancer should ask their doctors whether radiation therapy is an option for them and see a radiation oncologist before they have any active treatment for their prostate cancer. For more information on the TROG study, click here. To read more about how radiation therapy can help treat prostate cancer, click here. For more information on its benefits and effectiveness and for more information on Targeting Cancer, click here.